Tim Iacono reviews data compiled on EconomPicData that reveals American consumers are ratcheting down their use of credit cards, dropping toward 15% of personal income. Consumer debt has been rising for decades, but now it is being replaced by student loan debt, which has increased dramatically in the last 10 years to approach 5% of personal income. Iacono believes this will likely cause problems in the long term as getting an education begins to look less appealing and eventually impacts U.S. competitiveness in the global market. For more on this continue reading the following article from Tim Iacono. From this item at Jake’s EconomPicData blog the other day comes the graphic below depicting dramatic changes in consumer credit trends over the years. 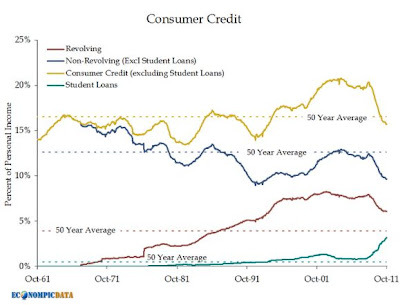 Racking up revolving credit (e.g., credit cards) is not nearly as popular as it was for decades, what I’ve long called “the real Reagan Revolution” as individuals dramatically increased their use of credit cards to fuel consumption (i.e., buying things you don’t need with money you don’t have). Taking up the slack for falling credit card balances are higher student loan balances that, already, are further separating the nation into have and have-nots (a.k.a. debt serfs) while making the whole idea of higher education less appealing when this is one the the things the country needs most to remain competitive with emerging economies in Asia. The notion that kids to day don't want to rack up student loan debt hits home for me as our two youngest boys have no interest in higher education when seeing their friends leave college with a huge debt and then not able to find a job in the field they were trained.Your point that it will hurt us in the long run is what will happen as the baby boomers retire and we need educated people. I guess we will have to draw from over seas.